The author wrote the story to give insight into his experience with the hope of influencing readers to transform their lives into something better and help them find God. The interactive novel also provides suggestions for how the reader can enhance their reading experience to make them feel as if they are immersed in a movie. 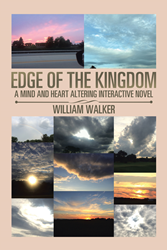 “Edge of the Kingdom” follows the story of a free spirt of the night and a soldier that defends the light as they discuss life and discover an eternal connection for just one night. Once they realize the connection between their hearts, the free spirit tries to get the soldier to discover something deep inside with the goal of finding the spirit of God from within the third eye. William Walker, who writes under the pen name will I AM, is an author and blogger at William Revelations. A former educator, Walker holds a Bachelor of Science in Secondary Education from the University of Illinois, a Master of Arts in Secondary Education from North Central College, and a Master of Arts in Education Administration from Concordia University. Walker is a supporter of the use of marijuana for medicinal and recreational purposes. He used to not believe in much until God knocked on his door one Friday evening and asked him to start spreading a message about love and Oneness. Now his mission is to take an active role in making a positive difference in the world and spread the message about the Oneness of God and start a global movement towards a resource based economy. Walker resides in Lake in the Hills, Illinois.